We all know not to judge a book by its cover, but who doesn’t really? If the cover isn’t appealing to you, why would you even bother picking it up? People are the same way; we’re attracted or turned off by what we see, but sometimes we miss out on some truly amazing people because of how we see them. I’m sure it’s happened to me before, and probably all of you at one point. I’ve been getting tattoos pretty regularly since I was 17. Not to an insane amount, but usually about one per year for about ten years. Each one has a very personal meaning and feeling associated with it. My most recent ones are, of course, for the kids. Those three hooligans are my heart and it only seems right to always have them with me. 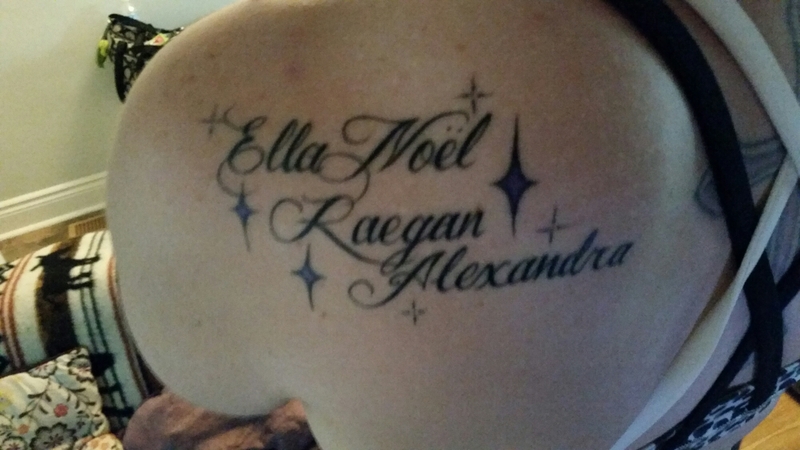 Ask any tattoo artist and they’ll tell you to never get someone else’s name tattooed on you; the exception, of course, for your kids. My girls, those tiny two pound babies, they’ve been through so much. They’ve filled my heart and soul to the brim and beyond. They are my stars in the darkest night, bringing me home and filling me with love. I will always be just a little bit unconventional, just a bit nutty, maybe even slightly radical, but I will always be true to myself, tattoos and all. This entry was posted in Baby love, Home is where the heart is, Mamahood and tagged body art, body expression, cerebral palsy, identical, momo, mono mono, motherhood, NICU, parenthood, parenting, preemies, special needs, tattoo, toddler, twins. Bookmark the permalink. I love it, it’s beautiful. What a unique way to celebrate your children!